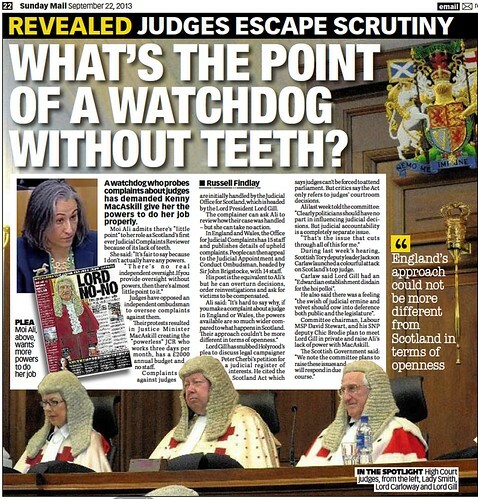 Scotland’s top judge declares he will not inform Judicial Investigator of complaints outcomes. 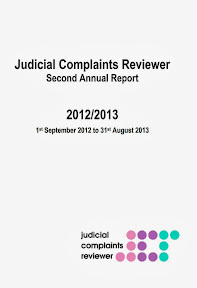 SCOTLAND’S top judge, Lord President Lord Brian Gill has told Judicial Complaints Reviewer (JCR) Moi Ali she is not to be informed of the outcomes of complaints against judges which are referred back to the Lord President by the JCR for further action. 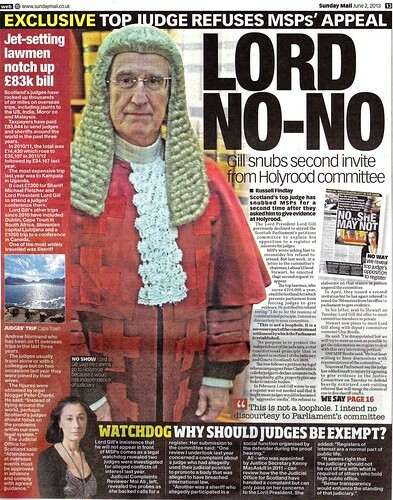 Eager to keep questions & complaints regarding the conduct of judges in court hidden from public scrutiny, Lord Gill branded the office of JCR as a “third party” which data could not be shared with for reasons of confidentiality. 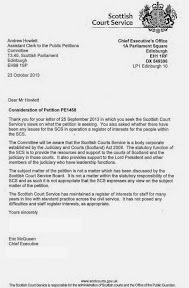 The latest development came to light in a submission to the Scottish Parliament’s Petitions Committee by JCR Moi Ali in response to Petition PE1458: Register of Interests for members of Scotland's judiciary. 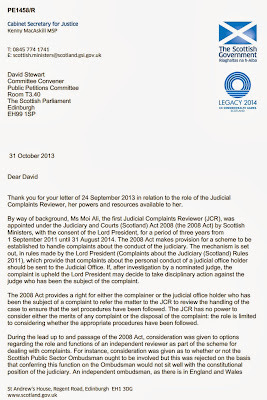 JCR told MSPs in letter the Lord President is treating her office as “third party” on complaints follow up information. Writing to MSP members of the Petitions Committee, Judicial Complaints Reviewer Moi Ali stated : The other matter that I wished to follow up on relates to the Lord President’s procedure for informing the Judicial Complaints Reviewer of outcomes following referrals. 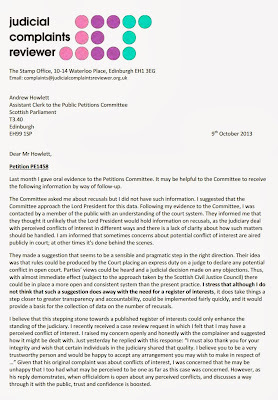 When I gave my evidence I explained to the Committee that I had written to the Lord President asking for clarity on what information would be given to me. I have since received a reply, so I am now in a position to clarify the process. 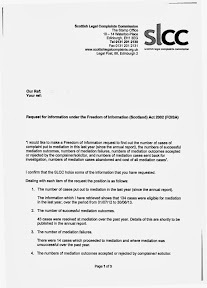 So the situation is that when I make a referral to the Lord President that the complaints Rules have been breached, I will be told what the Lord President proposes to do - for example, to reinvestigate the complaint – but thereafter I will be given no further information, such as whether the complaint was subsequently upheld, as this data cannot be shared with “third parties” for reasons of confidentiality. 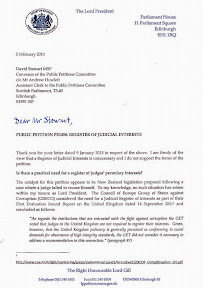 I am surprised at this response for two reasons: I do not regard the JCR as a “third party” but as an integral part of the complaints process; and in England and Wales, the outcomes of investigations, when upheld, are published on the Judicial Conduct and Investigations Office’s (JCIO) website. 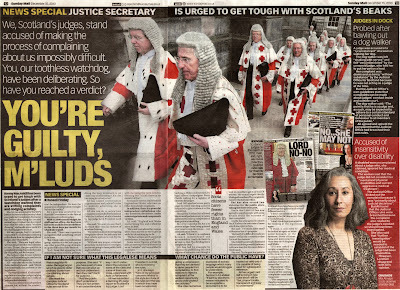 The JCIO is the closest equivalent body to the Judicial Office for Scotland, in that it supports the Lord Chancellor and the Lord Chief Justice (the equivalent of the Lord President, as head of the judiciary) in their joint responsibility for judicial discipline. It seeks to ensure that all judicial disciplinary issues are dealt with consistently, fairly and efficiently. Like the Judicial Office, it can only address complaints about a judicial office-holder's personal conduct and cannot deal with complaints about judicial decisions or about case management. 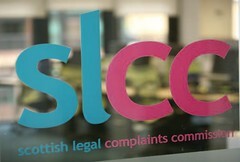 Although the Office of Judicial Complaints Reviewer was created by an Act of the Scottish Parliament in 2008, principally highlighted in Section 30, S31 and S32 of the Judiciary and Courts (Scotland) Act 2008, protests from Scotland’s judges over proposals in the 2008 legislation resulted in Justice Minister MacAskill creating the powerless Judicial Complaints Reviewer, who works for three days a month on an annual budget of £2000 and no staff. 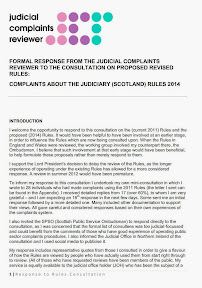 Also contained in the JCR’s recent response to MSPs was a suggestion of a proposal put forward by a “member of the public” regarding the gathering of data on recusals, information which has not been made available to MSPs on the Public Petitions Committee even though MSPs have three times requested the data from the Lord President himself. 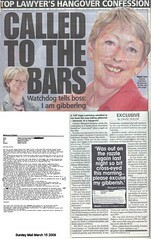 Moi Ali told MSPs in her letter : I was contacted by a member of the public with an understanding of the court system. They informed me that they thought it unlikely that the Lord President would hold information on recusals, as the judiciary deal with perceived conflicts of interest in different ways and there is a lack of clarity about how such matters should be handled. I am informed that sometimes concerns about potential conflict of interest are aired publicly in court; at other times it's done behind the scenes. They made a suggestion that seems to be a sensible and pragmatic step in the right direction. Their idea was that rules could be produced by the Court placing an express duty on a judge to declare any potential conflict in open court. 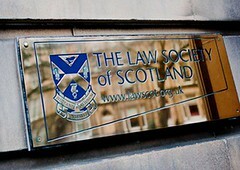 Parties’ views could be heard and a judicial decision made on any objections. 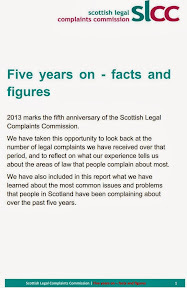 Thus, with almost immediate effect (subject to the approach taken by the Scottish Civil Justice Council) there could be in place a more open and consistent system than the present practice. I stress that although I do not think that such a suggestion does away with the need for a register of interests, it does take things a step closer to greater transparency and accountability, could be implemented fairly quickly, and it would provide a basis for the collection of data on the number of recusals. 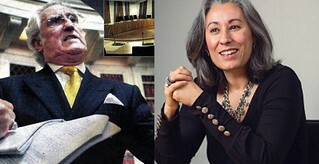 While the proposal to collect data on recusals is welcome, it is more probably that worried judges who are concerned about public exposure of their undeclared vast wealth, secret financial earnings outside their judicial duties and undeclared links & relationships, even memberships or directorships of organisations, companies & other vested interests, would use it as an excuse to delay the implementation of a full register of interests. 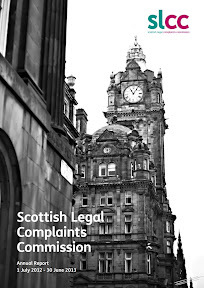 The Judicial Complaints Reviewer has given her support the terms of Petition PE1458: Register of Interests for members of Scotland's judiciary, reported in the Sunday Mail newspaper and Diary of Injustice, HERE.